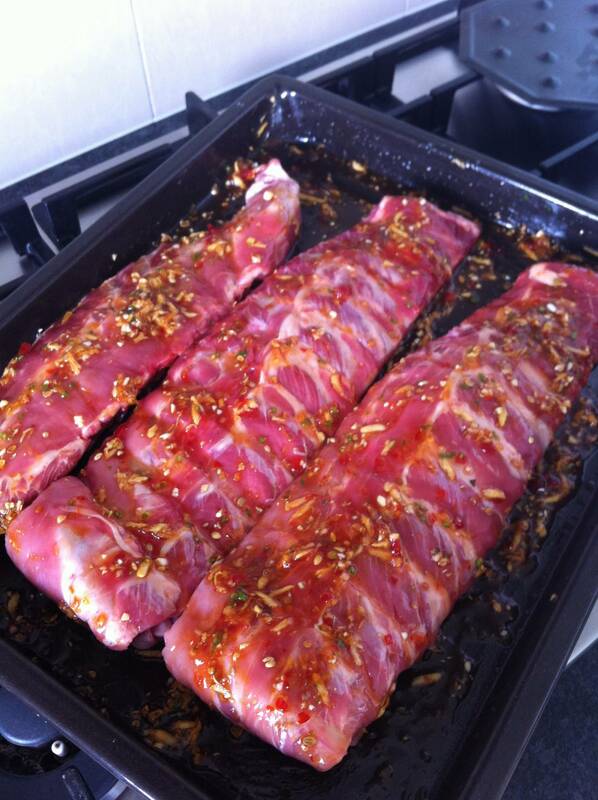 1 To make the marinade for sticky chilli ribs, mix together everything except ribs and water. Stir in vinegar and water. Put ribs in a large shallow dish and coat with marinade. Cover and leave for 2-3 hours at room temperature, or transfer to the fridge and marinate 8 hours or more (if refrigerating, bring ribs to room temperature before cooking). 2 Preheat oven to 180°C (350F°). Line a shallow ovenproof dish with heavy-duty tin foil, then line this with a piece of baking paper. Fold the sides of the foil in, to form a tin foil tray; this will stop marinade oozing out and burning in the tray (and makes washing up so easy!). 3 Put in the ribs and spoon over marinade. Cover with a lid of tin foil, sealing the edges. Bake ribs for 1 hour. Remove ribs from the oven, lift off foil lid (do this carefully as there’ll be steam underneath), and turn ribs over. Replace foil and continue cooking for a further 10-20 minutes, reducing oven temperature to 150°C (300F°). Aim to end up with the ribs beautifully tender and coated with a dark golden sticky glaze. Serve hottish. If the marinade dries up and looks set to scorch, add a little more water. If at the end of cooking the ribs are tender but have not glazed, remove foil lid, set pan over an element and let juices evaporate a little, then cook, turning ribs often, until glaze is sticky. Alternatively, glaze under a preheated grill. All this spicy chicken recipe calls for is a measuring spoon and a roasting tin. You'll produce gorgeously golden and succulent chicken that will have everyone licking their lips and asking for the recipe. Preserved lemon and spices really work their magic on lamb, giving it a spicy sweetness which tastes just as good as it smells during cooking.